Very near us in the north Georgia mountains is the site of New Echota, the last capital of the Cherokee nation. It is as tranquil and peaceful a place as I’ve ever visited. It occupies a level spot, perfect for farming, surrounded by the beauty of the mountains, the quiet calm of the forest, and the serenity of a gently flowing river. Yet, when you walk the site and explore the buildings, there is an almost palpable sense of sadness. This was the last true ancestral home of the Cherokee people and the site of the beginning of the infamous Trail of Tears. New Echota, established in 1825, is one of the most significant Cherokee Indian sites in the United States. During its short history, it was the site of the first Indian language newspaper office, a court case which carried to the U.S. Supreme Court, one of the earliest experiments in national self-government by an Indian tribe, the signing of a treaty which relinquished Cherokee claims to lands east of the Mississippi River, and the assembly of Indians for removal west. 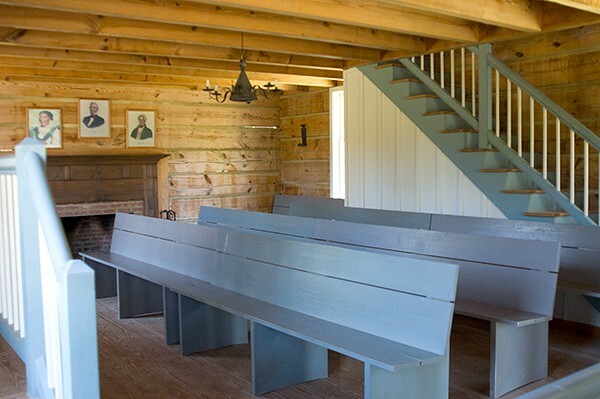 Even before New Echota was officially established, the Cherokee Council in 1819 began holding their annual meetings at the location. By 1830, the surveyed and planned community had about 50 residents, a main street, side streets, 100 one-acre town lots and a two-acre town square. The settlement included the Cherokee Council House, Supreme Court Building, Cherokee Phoenix Print Shop, many private homes, stores, a ferry, and a mission station nearby. Today, visitors to the site can tour 12 original and reconstructed buildings, including the council house, court house, print shop, missionary Samuel Worcester’s home, and an 1805 store, as well as outbuildings such as smoke houses, corn cribs, and barns. According to the 1835 Cherokee census, more than 90 percent of the Cherokee lived in small cabins on farms and tilled an average of 11 acres of land. Their farms included common buildings like corncribs, barns, and smokehouses. Fruit trees, vegetable gardens, and corn fields typically surrounded the farmsteads. The Council House served as the capitol building and headquarters of the Cherokee Nation. Abandoning their traditional clan system of ruling the tribe, the Cherokee established a republican system consisting of a legislature with a national council of 32 members and a national committee of 12 members. Both groups met at the council house where bills had to pass both bodies to become law. The Cherokee people elected the council members who chose the executive branch consisting of the Principal Chief, the Vice-Principal Chief, and the Treasurer. The Cherokee Supreme Court heard 246 cases from 1823-1835. Most were civil cases since criminal cases were settled in lower courts. The Cherokee Nation had no prison system. Those convicted of a crime were hanged, whipped, or fined. The building was also used as a church and a school when court was not in session. Constructed in 1828, the house served as a Presbyterian Mission Station and as the Worcester family home. Rev. Samuel Worcester helped to translate parts of the Bible and many hymns into the Cherokee language. He also started a church and school at New Echota and served as the town postmaster. 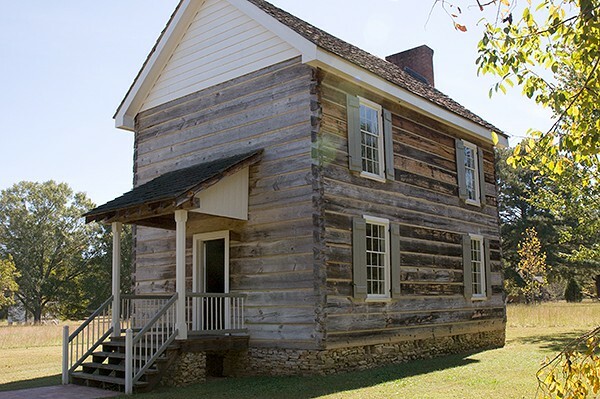 The Vann Tavern was constructed in 1805 by Chief James Vann, a wealthy Cherokee plantation owner. Vann’s home is a state historic site west of Chatsworth, Georgia. The tavern was moved to New Echota in 1955 and is similar to the 14 taverns owned by Vann throughout the Cherokee Nation, serving travelers as a restaurant, store, and inn. Chief Vann was one of the wealthiest men in the Western Hemisphere at the start of the 19th century. At the time, he owned about 200 slaves and hundreds of acres of farmland. The Phoenix Printing Office contained a Union style press purchased in Boston. Special printing type in both English and the Cherokee alphabet was cast for this unique printing office and on February 21, 1828, the first edition of the Cherokee Phoenix was printed. The Washington style press on display now is similar to the original. The print shop closed in 1834 due to lack of funds and the original press was seized by the Georgia Militia during the turmoil leading to the signing of the Treaty of New Echota of 1835 which ultimately led to the westward removal of the Cherokee on the Trail of Tears. Despite the Cherokee’s efforts to adopt a lifestyle similar to their non-Indian neighbors, conflict with state and federal governments increased in the early 1800’s. Under pressure from U.S. officials, several thousand Cherokee voluntarily moved west of the Mississippi River although the majority strongly opposed such a move. In 1830, the Congress passed an act authorizing use of force to move all remaining Cherokee westward. Increased demand for land by Georgia citizens and the discovery of gold on Cherokee land brought even more pressure for removal of the Cherokee people. The state of Georgia declared Cherokee laws void, annexed the Cherokee land as Cherokee County, Georgia, and passed laws aimed at making life miserable for the Cherokee people. Their land was surveyed, divided, and given away to Georgia citizens in the 1832 Georgia Land Lottery. With gold miners and land lottery winners flooding onto Cherokee lands, a small minority began to advocate for moving westward and in 1835 signed the Treaty of New Echota ceding all Cherokee lands, giving the Cherokee $5 million for their land and $300,000 for improvements to their new lands in Indian Territory (Oklahoma). The Cherokee were given two years to vacate their ancestral home. Many Cherokee considered the treaty fraudulent and refused to leave. They were ultimately rounded up and placed in stockades. “…we are despoiled of our private possessions, the indefeasible property of individuals. We are stripped of every attribute of freedom and eligibility for legal self-defence. Our property may be plundered before our eyes; violence may be committed on our persons; even our lives may be taken away, and there is none to regard our complaints. We are denationalized; we are disfranchised. We are deprived of membership in the human family! We have neither land nor home, nor resting place that can be called our own. “We are overwhelmed! Our hearts are sickened, our utterance is paralized, when we reflect on the condition in which we are placed, by the audacious practices of unprincipled men, who have managed their stratagems with so much dexterity as to impose on the Government of the United States, in the face of our earnest, solemn, and reiterated protestations. On May 26, 1838, the U. S. government began the forced removal of more than 16,000 Cherokee people from their homelands and sent them westward. Most spent the summer in crowded camps and left by wagon, horseback, and on foot during October and November on an 800-mile journey. They arrived during January, February, and March 1839. Although the exact number is not known, disease, exposure, and sickness claimed thousands of Cherokee lives during the course of the capture, imprisonment, and removal. Their ordeal became known as the Trail of Tears. I left New Echota on that beautiful October afternoon with a heavy heart and more questions than I had when we arrived. If you’ve never visited, I’d encourage you to go. It’s a truly beautiful place and a very educational activity. While you walk the grounds, just remember the lives that occupied that place and the trials they endured because of a desire for land and gold. Of course, there were “politics” deeply involved in the entire matter, but that will require much study to understand. At the heart of the matter, though, you will still find land and gold. New Echota is a Georgia State Park, a Traditional Cultural Property, a U.S. National Historic Landmark, and is listed on the U.S. National Register of Historic Places. The site is located at 1211 Chatsworth Hwy 225 N, Calhoun, Georgia. Hours are 9 a.m. to 5 p.m., Thursday through Saturday. Closed Thanksgiving, Christmas, and New Year’s Day. A visitors center offers guests an opportunity to view interpretive exhibits and a 17-minute film, and to purchase souvenirs, books, and music. The site tour is self-guided and also includes nature trails leading to New Town Creek and a small beaver pond. Allow a minimum of two hours to fully explore the entire 200+ acre open air museum. Personal Note: Throughout this post I have used the term “Indian” even though my own inclination was to use “Native American.” I did this because all of the marketing materials, brochures, and web sites pertaining to New Echota use the term Indian. Only the greatest respect is intended. What a remarkable visit Lana – I learned so much reading this post! I can’t help feeling a heavy heart too – thinking about all that happened so many years ago. Thank you for sharing. You’re welcome, Martha. It’s a lovely place to visit, but it does provoke a lot of thought about the events of that time. I have always loved reading about Native Americans and their plight. I wish I could turn back time and help these people who were so miserably treated by our government and our people. What bothers me most is that no one wants to recognize the crimes committed by anyone, and our people as well pretend that no evil was committed. Your article was amazingly written. Thank you for sharing your thoughts and pictures. I also love all your dishes. I have tried many and they all were a hit with family and friends. Thank you very much, Marie. I could so wish that this episode in our history never happened. It’s incredible to think how cruelly the Cherokee were treated. This great. I would love to see this cite in Calhoun, Ga. I look forward to a trip possibly 2016. Thank you again for this update. I do hope you have a chance to visit, Estella. It is a fascinating place! We have family in Georgia and just visited there a year ago. I fell in love with the area! We didn’t make it to New Echota, in fact I’ve heard of it, so this was very interesting. We love to travel and look forward to checking this out next time we’re in the area! I hope you will have an opportunity to visit sometime, Kimberly. It’s a beautiful site and very informative. what a great trip and post…very informative. Wow- what an informational and interesting trip. We love learning trips in our family. We do, too, Jessica. We always plan our vacations around museums and historic sites. I hope to be able to visit one day. and bring my family. We have Cherokee blood on my dad’s side (my great grandma). but sadly were raised without any history or knowledge of that side of us. My brother and sisters and I have always wanted to learn more, but aren’t sure where to begin. This weighs heavy on my heart as well, but I’m glad that the area was preserved for future generations to learn from. Such a sad point in our history. But visiting a these exhibits brings more social awareness–always a good thing! Very sad, Liz. And yes, visiting the site makes it really come alive. I can’t believe that being a Georgia native I’ve never visited. I learned so much from your post Lana. Thanks for sharing. Thanks for reading, Paula. I hope you get to visit one day. I enjoyed this post Lana and in seeing all these photos. You had me yearning for a simpler time. Simpler perhaps, but not easier. Love the history here. I often wish for simpler times, Renee. I sometimes think it would be nice to have not so many things, not so many choices, and a slower pace. What a wonderful trip, I can’t wait until the kids are older and we can take trips like this again. There’s so much history and wonderful things to learn in our country! Yes there is, Angie! And I’m so thankful for groups like the state parks system that keeps these places alive! What an interesting post! I must admit I know very little history about the Cherokee – but I’d like to learn more after reading this. I hope you will, Erin. It’s a very sad, but fascinating episode from our history. Wow! Thanks for the detail both in your story and photos. Now on my bucket list of places to visit for sure! This is such a great post Lana. My dad was fascinated by Native culture, his best friend growing up was Native American. After my mom passed away he actually ended up marrying his friend years later. They had a beautiful ceremony with all the traditions of her culture, her dress was amazing, the ceremony was touching. I grew up travelling to every landmark and area my dad read about. I have a jewelry box full of mementos from our travels when I was a kid and then later when he travelled with his wife. He collected artwork too which I inherited. The stories behind every piece are amazing. I wish more people knew the sad and tragic tales of what happened to so many of these people. Places like this help tell those stories. I’ve not been to this particular place but it’s on my list of “to do’s”. Your photos were amazing. Always a pleasure to swing by here. What a great day trip! I love that first shot by the window – it’s gorgeous! Last year we went on a similar journey to Appomattox Courthouse and I had a similar feeling of awe when walking around the homes and buildings. It’s a completely different experience when yo can physically walk on the same ground as others have. We studied the Trail of Tears in school and this is wonderful to be able to look at all of these photos. I’m a total history geek and I am totally going to have to visit there! Wow I am from NC and heard about the cherokee country but had not visited! So many great things to see! That looks like a great trip to drink in history.